Who is actually buying the most expensive jewelry in the world? 1. For $80 million dollars, the Qatari Royal Family purchased the 31-carat Wittelsbach-Graff diamond. Called "the most-expensive piece of jewelry ever made in the world" as of 2015, the Wittelsbach-Graff diamond has been around at least since 1664, and its previous owners included the kings and queens of Spain, Austria and Bavaria. After changing hands several times due to the world wars, it finally turned up in a Christie's auction in 2008, which is where the famous London jeweller Laurence Graff bought the diamond for $23.4 million. Still, he wanted to improve it to make it even more valuable. 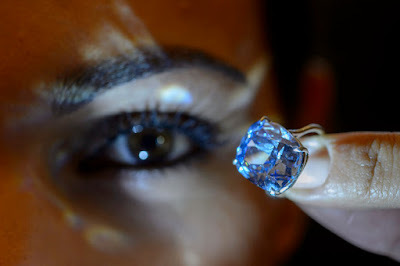 Using great expertise, he recut the diamond, raising its grade to an extremely rare "fancy, deep-blue and internally flawless" diamond. Since it belonged to royalty for so many years before, it seems only fitting that royalty should possess it again. Around 2011, reports emerged that Graff had sold the Wittelsbach-Graff diamond to a member of the Qatari royal family, who wishes to remain unknown, for $80 million dollars. We do know that the head of the Qatari Royal Family, at least until 2013, was the Emir Hamad bin Khalifa Al Thani, who had a net worth of around $2.4 billion dollars. Some others just spend millions on jewelry just because they can. 2. Hong Kong billionaire Joseph Lau bought $77 million in diamonds for his daughter. 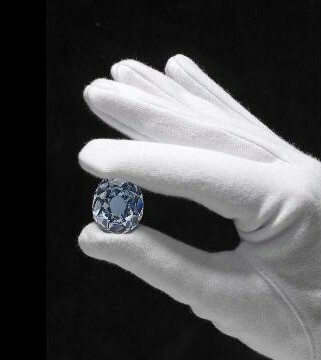 The largest, cushion-shaped, vivid-blue diamond that ever went to a Sotheby's auction, one was the 12.03-carat "Blue Moon" diamond ring that he renamed, "The Blue Moon of Josephine." Also extraordinarily rare, he bought her a 16.08-carat, vivid-pink diamond for $28.5 million from a Christie's auction, and he renamed it "Sweet Josephine." I guess it comes as no surprise given that in 2009, he also bought two rare diamonds for his 13-year-old daughter Zoe that were worth more than $40 million dollars altogether, according to the Daily Mail Online. 3. Floyd Mayweather a.k.a. 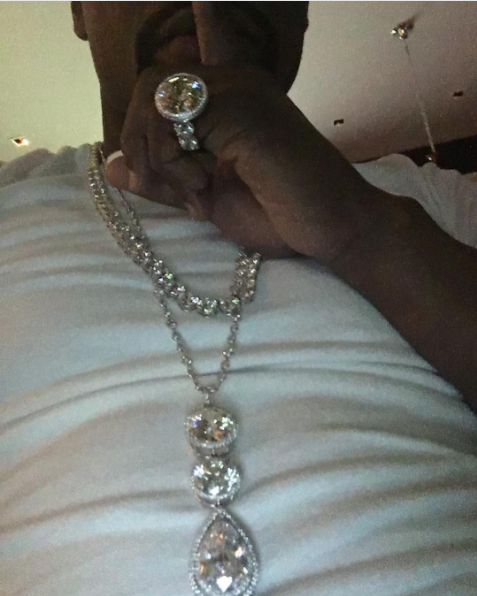 "Money" bought around $15 million dollars in diamonds, just for himself. Here's a performer who knows how to treat himself to the "finer things in life." He proved that diamonds aren't just a girl's best friend anymore when he picked up a 50-carat diamond pinky ring to go along with a 74-diamond necklace, and each diamond on the necklace is three carats. Rolling Stone shared the details about how these new gems enhance his already highly colorful lifestyle. See them for yourself in his photo on Instagram. How many millions went to buy jewelry to please wives or propose? 4. Victoria Beckham received at least $9.2 million in jewelry from her hubby. David Beckham enjoys spoiling his wife with jewelry that's worthy of royalty. He's given her a ruby and diamond necklace worth $1.2 million, and that was just the beginning. Valentine's Day was even more spectacular with an $8 million dollar Bulgari brand diamond necklace, according to this report. 5. Surely you've heard of Kim Kardashian's $8 million dollar engagement ring? As you might expect, Kim Kardashian's husband is very much the same kind of big spender that she is. Kanye West got her a jaw-dropping 15-carat, cushion-cut diamond ring when he proposed. It cost $8 million not just because of the sheer size and quality of the diamond but also because it was a custom design he made with the famous jeweler Lorraine Schwartz, who also created Beyoncé’s engagement ring too. You can read more about celebrity engagement rings like these here.